Pokemon: Crystal Version (Nintendo Game Boy Color, 2001) Shipped with USPS First Class Package. Authentic | Saves Perfectly | Good Condition. Language : Japanese. We are Japanese. Condition : Used. International Warranty does not apply to this product. Brand: Nintendo Game Boy Title: pokemon Pocket monsters (japan) Gold Silver Crystal Version. Japanese Version !! Complete 3Set !! . Cleaned and tested copy of Pokemon Crystal for Nintendo Game boy Color. Plays great and holds saves. Cartridge shows normal signs of wear. Compatible with all Gameboy Color, Advance, SP, Micro, Nintendo DS, and DS Lite systems. THE PHOTO SHOWN IS AN EXAMPLE. YOUR ITEM WILL BE SIMILAR BUT MIGHT NOT MATCH EXACTLY. If you are not happy with it we will work to fix the problem. Just let us know. How long will my order take to arrive?. 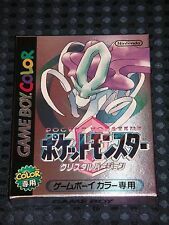 Pokemon: Crystal Version (Nintendo Game Boy Color, 2001) - Japanese Version. Condition is Very Good. Dispatched with Royal Mail 1st Class Large Letter.